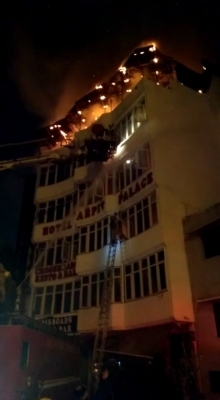 New Delhi, Feb 14 (IANS) An Inspector with the Food and Drug Administration (FDA) from Pune was one of the 17 persons who died in a fire tragedy at Arpit Palace hotel in the heart of the national capital on early Tuesday. "Rahul Kumar, who was in Delhi, had talked to his wife over phone informing her that he would return on Tuesday, but he did not know he would also die along with two of his friends -- Dr Shankar Narayan and Dr Santosh Wale -- who were putting up in Room No. 401 of the hotel," his relative Srinivasan told IANS. Dr Shankar Narayan from Tamil Nadu and Dr Santosh Wale had come to Delhi to attend a medical seminar in Connaught Place. They had booked a room in the ill-fated hotel. "On Monday night, they called their old friend Rahul Kumar for a meeting in the hotel. Rahul told his wife that he wanted to leave but he would stay with Santosh Wale and Shankar Narayan due to their insistence," Srinivasan said. "In the fire tragedy, they all were suffocated to death after being trapped in their room and could not get out," he added.